Once upon a time, a priest came to his friend’s parish on a visit. His friend was recently posted to the parish and he came to know the new location and to spend the weekend with him. On Sunday morning, well before the commencement of the mass, the hosting priest asked the visiting priest to take up the function of preaching at the mass while he would celebrate the mass. The visiting priest agreed and took some minutes to reflect on the readings before the mass started. The homily given that day by the visiting priest took the congregation by storm. In fact it was the talk of the day. However something quiet confusing happened. A married couple came to consult with the visiting priest after the mass. Upon meeting him they sought to know how he was able to know what has been happening in their family. The visiting priest was baffled by the question and he declared without hesitation that he could not remember knowing either the man, the woman or any member of their family. The couple insisted that the priest may have been told about every single thing that has been going on in their family, but the priest stood his ground to declare that he could not figure out what they were talking about. At this point, the male counterpart now asked: “How then did you know all that has been happening in our family as the homily you gave today was all about our family; are you a prophet?” It was at this point that the priest understood that his homily spoke directly to them and the issues in their family; in fact his illustration were so exact to be a mere coincidence. We shall begin by taking a closer look at the phenomenon called “PROPHECY”. We can achieve this by getting to know first whom a PROPHET is. We can actually begin by asking the question: “who is a prophet?” Some people may say that a prophet is someone who says what someone has in mind or someone who foretells the future about people or events. But this is not the actual definition of a prophet. The word prophet comes from the Greek “prophetes” which literally means a spokesman or if you like one who speaks for another. A Seer on the other hand can be said to be someone who has the gift of seeing beyond the present that is the past and the future. It could actually be that the couple in our story meant to call the visiting priest a Seer. To make our point clearer, a prophet of God is one who speaks on behalf of God or in the name of God. In doing this he might refer to the past or a future event. But he is not merely a futurologist. Furthermore, it is not enough to speak in the name of God, such an individual must be called by God and backed by His authority. This brings us to the fact of AUTHORITY. Authority can be understood as legitimate or rightful power given to a person or persons to carry out some activities; for instance, commanding authority. On the other hand, power is merely the ability to carry out an activity effectively. Since the inception of the ordinary time of this liturgical year, we have been reflecting on God’s call. We saw that of Samuel, Jonah, and the fishermen who eventually became apostles. Today we are presented with the fact that prophetic mission goes with prophetic authority. In the First Reading (Deut. 18:15-20) we discover Moses assuring the people of God’s provision of a prophet like him who will speak the word of which he would be given. 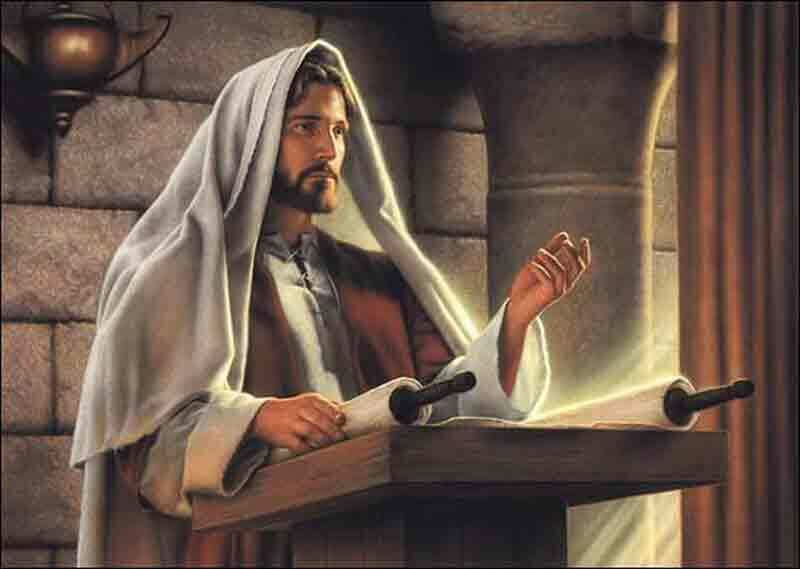 He also instructed the people to listen to him as the words he would be speaking belongs to God. On another hand the prophet is expected to speak only in the name of God and not in the name of other gods which will bring about damnation. It will be very convenient for us to say that the prophet referred to in the First Reading is Joshua since he took over from Moses and God also assured him that as He was with Moses his servant He shall also be with him (Joshua 1:5). This may not be a very wrong guess much as it is not exact. The prophet referred to in First Reading goes beyond Joshua. In fact, it accurately points to our Lord Jesus Christ who came as the greatest prophet and spoke in the name of God with authority as the Gospel Reading (Mark 1:21b-28) made us to know. They were Mediators: Moses was a mediator between the people of Israel and God from the moment God called him through the burning bush (Ex.3: 4ff). Our Lord Jesus Christ himself is fittingly called the mediator between God and men (1 Tim.2:5). Great Leaders: Moses led the people of Israel out of Egypt on their way to the Promised Land. Our Lord Jesus Christ on the other hand led humanity out of darkness of sin and death into God’s marvellous light (1 Peter 2:9). There is every need for us to reckon with the fact that every prophetic mission goes with a corresponding prophetic authority. This authority comes from God through His words. There is a big difference between the word of God and the word of man. Today we hear so many people declaring their own word as opposed to the word of God. There are many people who are today commercializing Christianity as people are made to pay money in exchange for prayers and miracles. The word of God we are told is something alive and active (Heb.4:12). When the word of God is genuinely preached it leads people primarily to repentance, love of God and neighbour and ultimately to salvation not just assurances of prosperity and victory over enemies. Someone could ask: “what is next when we have all the prosperity in this world and all our enemies are defeated? It is for this reason that our Lord Jesus Christ advised us to seek first the kingdom of God and its righteousness and all other things will be added unto us (Matt.6:33). Those who speak their own word other than the word of God will be punished by God. Another important point we must acknowledge today is drawn from the healing of the man with unclean spirit as we read from the Gospel today. We are told that the unclean spirits recognized our Lord Jesus Christ and not only called him Jesus of Nazareth but also the Holy One of God. On our part as those who hear the prophetic utterances do we recognize the Lord in the message and the people are required by Him to accept the words of the prophet as they are His words. As we launch into a new week let us be conscious of the call from God through St. Paul in the Second Reading (1 Cor.7:32-35) that we should have UNDIVIDED DEVOTION to the Lord. This applicable to all of us whether as preachers of the word or as receivers of the word of God. Do have a blissful Sunday and a blessed week ahead! Fr. Bonnie, you are one of the prophets of our time. May God continue to grant you Great Grace to continue leading men to God. In Jesus Name; Amen! God Bless You For Us.